For the beginner - Hebridean Surf will look after you at a secluded spot in manageable waves, where all your time in the water will benefit you - no waiting around or trying to find space amongst the more able. We offer 2.5 hour junior and adult tuition classes for those with little or no previous experience - learn how to catch a wave and how to stand, with a full understanding of your safety and your equipment - performing comfortably within your limitations. 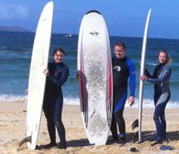 Our 20 plus years surfing experience, our knowledge and our understanding of local conditions and forecasts, will start you on your journey of being carried shore-wards on the face of a wave, to the exhilaration experienced when you carve your own creative and skilled path across the face of an Atlantic swell. One to one tuition and private or corporate groups welcome, Group discounts available - contact us for more info.